What do you do if you are a Landlord and are unhappy with your current Property Manager? home > Managing > What do you do if you are a Landlord and are unhappy with your current Property Manager? John Pye Real Estate picks up a large number of property managements where Landlords are stressed out over their current management situation. If this sounds like the situation you are finding yourself in, we can help! In some situations, we hear about Landlords who have had to put up with unsatisfactory service over a very long time and simply don’t know how to change their current situation so that they can have a stress-free experience in the management of their investment property. Change of Property Managers – one Landlord we spoke to just this week has had 3 individual Property Manager’s care for his property within the same agency, in the one year! 1.What are the issues you are facing? Have you discussed the issues with your Property Manager or Principal of the agency who manage your property? 2. What fees do you pay? We have discovered that some pay low fees and receive poor service – the old adage that, ‘you get what you pay for’ is generally true. But it is also true that some people pay expensive fees and actually don’t receive the service they deserve. Our company service fees are competitive, but we have been told our management is far superior. 3. What is the termination clause in your agency agreement? Usually, this is 30-days but we have come across one agency which is always 60-days and another, 90 days.If there is a breach of the agreement between your agent and landlord, then it may be possible to terminate immediately. If not, notice has to be given as per your existing agreement. Some Landlords have the idea that while ever their current tenant is in occupation of their investment property, they are obliged to use the agent which found the tenant. This is not true at all and is misinformation that many believe. 4. What are your expectations in the management of your property? 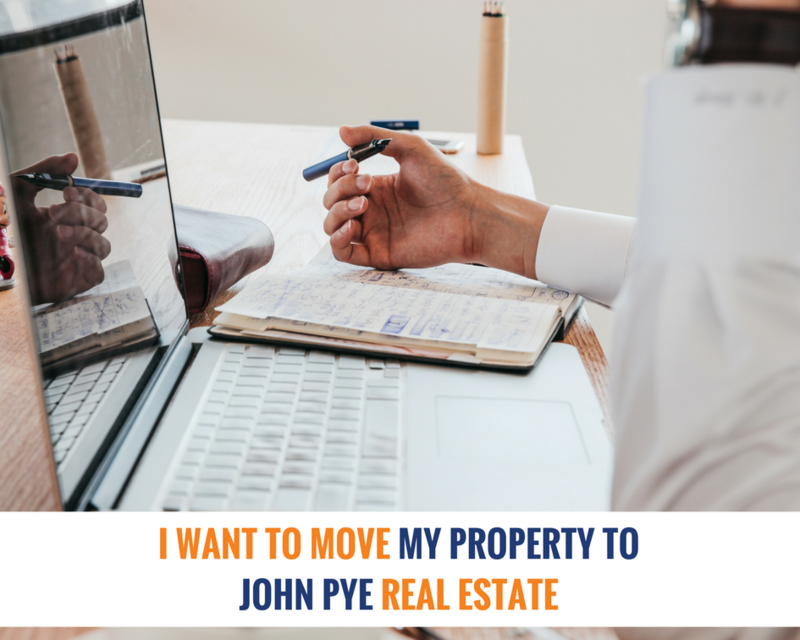 The process of the change to John Pye Real Estate is very simple. 1.You as the Landlord emails, or delivers or posts a letter to your current agent advising the termination in accordance with the Managing Agency Agreement. A copy of this letter should be sent to our agency as well. If they happen to have a 60 or 90-day agreement, John Pye Real Estate will suggest they reduce it to 30-days, in which case, John Pye Real Estate will pay out the fees due to the other agency so that the Landlord is not out of pocket by paying double fees. 2. Once John Pye Real Estate receives acknowledgement of the termination by the other company, our staff write to the other property manager requesting that the Tenant File is made ready for pick up on the transfer date. On handover day, our Property Manager contacts your tenant regarding future rent payments. As well, an appointment is made to view the property on the first practicable occasion – usually within a week or two. There is absolutely no charges involved in a management transfer if your tenant remains in occupancy of the property. The most important thing to remember is that a transfer is a simple process and we can say from experience that you as a Landlord will experience a relief from the stress that you may have previously experienced.